American Institute of Physics. Hardcover. 0883187922 Like New Condition. . Fine. Woodbury, NY: American Institute of Physics, 1997. First Edition. Hardcover. New/New. Hardcover in dust jacket. First edition. Book is New in publisher's original unopened shrinkwrap. 8vo. 337 pp. including index. New York: American Institute of Physics. Very Good+ in Very Good+ dust jacket. 1992. First Edition. Hardcover. 336 pp. Illus. Spine bumped. Jacket has light edgewear. Volume 4 of the Masters of Modern Physics series. 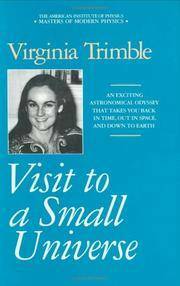 A fascinating collection of 36 essays on astronomy and astrophyics. Heavy book. ; 8vo 8" - 9" tall . Woodbury, NY: American Institute of Physics, 1993. Book. As New. Cloth. First Edition. Octavo, grey/blue cloth covered boards. 336 pp. A very tight, clean, fresh, unmarked and unread volume in a crisp, tight, sharp, sparkling dust jacket. Fine in fine dust jacket. AS NEw. Amer Inst of Physics, 1992. Hardcover. Like new condition in bright and crisp dust jacket which is now in a clear protective mylar sleeve.. 336pp. Condition: Like new condition in bright and crisp dust jacket which is now in a clear protective mylar sleeve. Visit to a Small Universe. NY:: American Institute of Physics,. Fine in Fine dust jacket. 1992. Hardcover. 0883187922 . First edition. Fine in a fine dust jacket. .
New York: Am. Institute of Physics. Very Good Condition, very bright hardback, ex-lib. 1992. ISBN 0-88318-792-2 . American Institute of Physics. Hardcover. GOOD. Spine creases, wear to binding and pages from reading. May contain limited notes, underlining or highlighting that does affect the text. Possible ex library copy, thatâll have the markings and stickers associated from the library. Accessories such as CD, codes, toys, may not be included.